The Indian Contract Act, 1872 has made it clear that there is a thin line of difference between void and illegal agreement. A void agreement is one which may not be prohibited under law, while an illegal agreement is strictly prohibited by law and the parties to the agreement can be penalized for entering into such an agreement. A void agreement has no legal consequences, because it is null from the very beginning. Conversely, illegal agreement is devoid of any legal effect, since it is started. All illegal agreement are void, but the reverse is not true. If an agreement is illegal, other agreements related to it are said to be void. 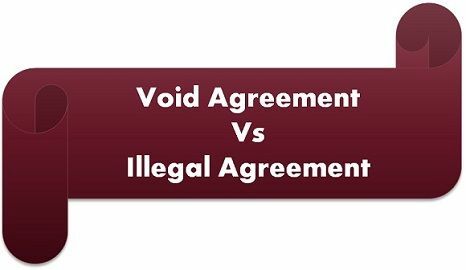 By learning the distinction between the two types of agreement, you will be able to understand that which one is void and which is unlawful i.e. illegal. So, take a read of the given article carefully. Meaning An agreement, which lacks legal enforceability is void agreement. An agreement whose creation is forbidden by the court of law is an illegal agreement. Consequence An agreement becomes void when it loses its enforceability by law. An illegal agreement is void ab initio i.e. void from the very beginning. Penalty Parties to void agreement are not liable for any penalty under law. Parties to illegal agreement are penalized. Connected agreements May not necessarily be void, they may be valid also. All connected agreements are void. The term ‘void’ means no legal binding and ‘agreement’ means consensus between parties regarding a course of action. To simply, put a void agreement is an agreement which is not legally binding, i.e. an agreement which lacks enforceability by law is void. A void agreement loses its legal binding nature when declared void. Such agreement does not create any rights and obligation for the parties, as well as the parties, do not get any legal status. The transactions associated with the void transaction would be valid. Certain agreements are void ab initio as per Indian Contract Act, which are – Agreement in restraint of marriage, agreement in restraint of trade, agreement in restraint of legal proceeding, agreement with minor, agreement whose object or consideration is unlawful, wagering agreement, etc. An agreement that violates any law or whose nature is criminal or is opposed to any public policy or immoral is an illegal agreement. These agreements are void ab initio, and so the agreements collateral to the original agreement are also void. Here collateral agreement refers to the transaction associated or incidental to the main agreement. The law strictly prohibits such agreements, hence entering into an illegal agreement is called a punishable offence in the eyes of law. Therefore, the parties are penalised for the same, under Indian Penal Code. Some examples of an illegal agreement are like an agreement whose terms are not certain, or an agreement to kill someone, etc. An agreement which loses its legal status is a void agreement. An illegal agreement is one which is not permissible under law. Certain void agreements are void ab initio while some agreements become void when it loses its legal binding. On the other hand, an Illegal agreement is void since the very beginning. A void agreement is not prohibited by Indian Penal Code (IPC), but IPC strictly prohibits an illegal agreement. The scope a void contract is comparatively wider than an illegal contract as all agreements which are void may not necessarily be illegal, but all illegal agreements are void from its inception. A void agreement is not punishable under law whereas an illegal agreement is considered as an offence, hence the parties to it are punishable and penalised under Indian Penal Code (IPC). Collateral agreements of a void agreement may or may not be void i.e. they may be valid also. Conversely, collateral agreements of an illegal agreement cannot be enforceable by law as they are void ab initio. After reviewing the above points, it is quite clear that the void and illegal agreement are very different. One of the factors that make an agreement void is the illegality of the contract, such as contract whose object or consideration is unlawful. Moreover, in both the two agreements loses its enforceability by law. I have been serving as legal document translator from Turkish into English or from English to Turkish as an English teacher for many years. Today I needed to see differences between two similar words and when I logged on the web, I have notice this page. This is what I was looking for. Thanks a lot!